Bear collectibles is a rather ambiguous term simply meaning anything which resembles a teddy bear and which has a monetary value of some sort. Of course many teddy bear collectors don't do it for the money but for the enjoyment and that is why Teddy bear collecting has continued to be a continuing growing hobby amongst adults. Of course there comes a time when some part time collectors make a decision that they would like to take their bear collection more seriously and it is at this point that some serious thought has to be made to avoid later pitfalls. Teddy bears come in all sorts of sizes but for the most part they are of a size that will require some considerable space as your collection grows. This is more of a problem if you plan to display them properly in your home, they may require special cases or cabinets which in themselves will be very space hungry. So the space available to you will have an impact on perhaps what sort of teddy bear collection you will be able to have. If you live in a small flat, you may want to consider collecting miniature bear collectibles or perhaps bear memorabilia such as key rings and other small novelty items. If you don't take space into account at the beginning of your collection you can soon find that things get out of hand and it can indeed have a negative impact on family relations. I have heard of many husbands and wives arguing over the space taken up with bear collectibles. Collecting teddy bears can be as expensive as you want it to be. If you are looking at collecting very rare and top quality bears you will have to have some very deep pockets. At the top end of bear collecting, thousands of pounds can be exchanged at auction rooms and between private sellers. 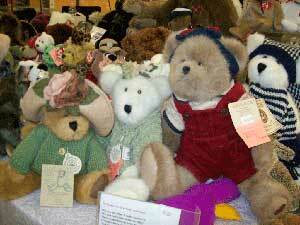 However you can still collect antique teddy bears perhaps from the 1930's and 50's. These bears can still be of value and be very sort after but their cost will not be as great, but be prepared still to spend hundreds in some cases. At the bottom end of collecting teddy bears, there are of course many options. 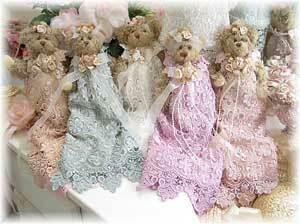 From simple second hand bears sold in charity shops to slightly more cared for ones on eBay. In both of these cases you can buy bears from a few pounds to perhaps a few tens of pounds. Remember you never know when that £5 bear you bought at the jumble sale may suddenly become more desirable amongst other teddy bear collectors and be worth a lot more. Be realistic about how much you want to spend on your collection and choose your field accordingly. 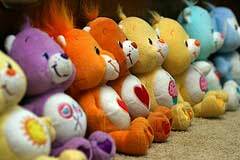 Collecting teddy bears is enjoyable and its all too easy just to see the fun side of things. But if you want to be a serious collector you will have to consider how you are going to keep records of all your bears. We will talk more about how best to do this on another page, but for now you will need to start to think about how you will keep records.